Shirebrook in North-East Derbyshire is a town on the up. Recent years has seen Bolsover District Council build new homes, the thriving town itself continues to see independent stores and chains do well, and its Town Council is determined to continue to invest in its future. For the first time, Shirebrook will soon have its very own town hall. 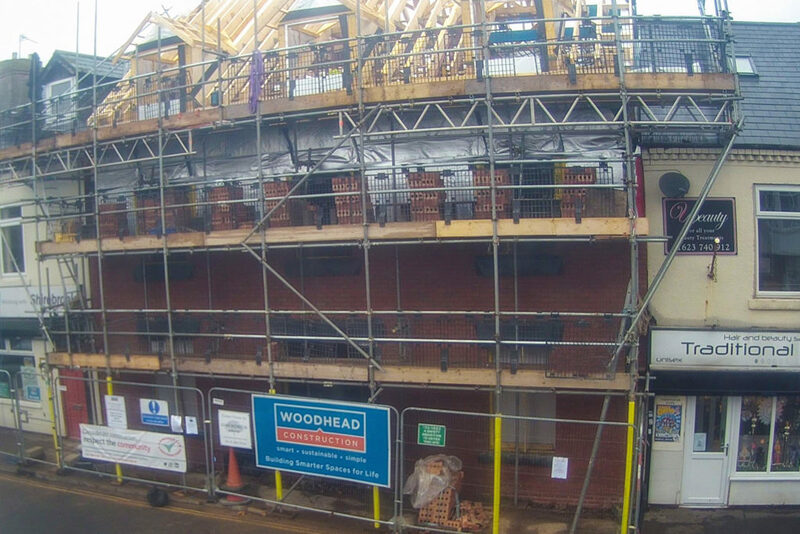 Set between two terraced properties on the market place, the three storey building is being constructed by the Woodhead Group. The ground floor of the building will be rented by Bolsover District Council, to provide local people with a place to talk about housing issues and pay their rent, while the upper two floors will be the Town Council’s chambers and offices. Vice Chairman of Shirebrook Town Council and Bolsover District Councillor, Cllr Steve Fritchley, said: “It’s fair to say that if it wasn’t for Woodhead, this project wouldn’t have got off the ground. We were in a position where we wanted to build a Town Hall for the people of Shirebrook, but the quotes we’d had for doing this, based on the designs we’d had drawn up, made it just an impossible task. The town hall replaces a shed-like building which wasn’t fit for purpose, and had previously housed the town’s market stalls. Woodhead carefully managed the demolition of the old structure, to begin groundworks, making way for a month-long process of erecting the timber frame structure. The structural elements and layout of the building have been built off-site, with each element of the structure being pre-fabricated, ready to put together in situ. It’s a tricky process, but a speedy one, reducing the programme length and the impact on local business and residents alike. The site is also very limited on space, so the timber frame reduces the practice of dirty works on site usually, characterised by traditional brick and block builds. Construction Director, Craig Pygall, said: “We were keen to find a way to make this building work for the Town Council and the surrounding community. The original plans suggested a traditional structure with steel frame and block and bricks. We could see there was an opportunity to do a great job here, so we worked with our architects to value-engineer the project and find a better way to deliver it.